A short 15 km trek route leads from Mussoorie to the temple of Bhadraj via Park Toll-Clods end, Dudhi. Situated on the extreme western region of Mussoorie town, Bhadraj offers a commanding view of the Doon Valley. Chakrata ranges and the Jaunsar Bawar area of Garhwal Himalayas. 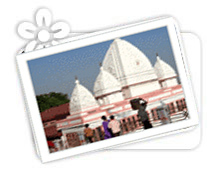 Bhadraj temple dedicated to Lord Bal Bhadra, brother of Lord Krishna, is situated on top of the hill. An annual fair is organised in the third week of August (Shravan Sankranti) every year.